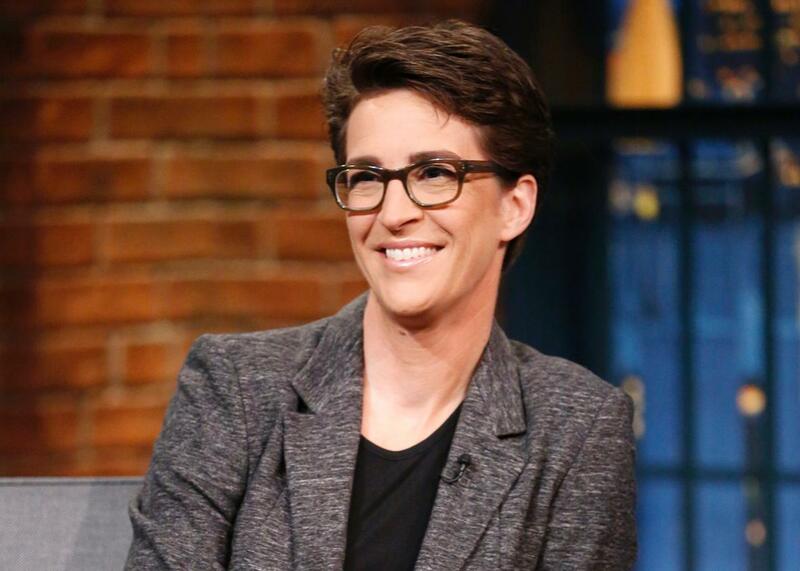 Rachel Maddow always believed in Bernie Sanders. And thinks she’s figured out how to cover Donald Trump. Rachel Maddow, during an interview on July 22, 2015. It’s been a lively election year at MSNBC. Joe Scarborough and Mika Brzezinski, the co-hosts of Morning Joe, have been criticized for handling Donald Trump with kid gloves. Melissa Harris-Perry left the network after what she says were numerous slights. (The network disputes her claims.) Despite all the controversy, or perhaps because of it, MSNBC has enjoyed solid ratings. To discuss the network’s campaign coverage, I spoke by phone late last week with Rachel Maddow, the host of MSNBC’s eponymous 9 p.m. show and an unabashedly progressive voice. Over the course of our conversation, which has been edited and condensed for clarity, we discussed the keys to interviewing Trump, the surprising lack of collaboration between MSNBC’s on-air personalities, and why she doesn’t watch her competitor Megyn Kelly. Chotiner: How would you assess the Trump coverage on cable news? Maddow: I absolutely hear it when people complain that Trump gets too much time on television, but I do think it can at least be explained, if not excused. It’s part of his campaign style to be unpredictable, to not always say the same thing. Yeah, he does have a stump speech. That’s true of any candidate, but in addition to the stump speech repetition and that sort of discipline, his indiscipline, or at least his willingness to say unexpected things and go unexpectedly shocking places at unpredictable times, means that it’s worth it to have a camera there whenever he’s talking. I think that the criticism is fair, but I also think that the coverage has been understandable. Other candidates are reasonably frustrated by it, but they should also take it as a challenge to up their own media game so that reporters think it’s worth having a camera there every time they talk too. —the more disturbing aspect is the lack of scrutiny he’s received. This has changed a little in the past few weeks, but certainly on CNN, certainly on Fox News shows not hosted by Megyn Kelly, certainly on Morning Joe, it just feels like he’s not been held to account for some of his more grotesque statements. Or asked hard questions. Regardless of the volume of coverage, when the quality of the coverage is simply to hand a candidate a microphone in an unmediated way and to use interviews to just set him up to talk more, that’s problematic for any candidate, particularly him, when he’s said stuff that’s hard to defend. I will say that I think that he’s good at evading difficult questions. What he’s particularly good at is defying people their follow-ups. You’ll see a person ask him a challenging question, confront him on something that he said, and he comes back with an incredible diversion from whatever that is, and he makes the diversion compelling enough that it feels like you can’t walk away from that topic. I think that your colleague Chris Matthews did a really great interview with Trump. Matthews isn’t easily diverted. I could not agree with you more. I love Chris Matthews, but this is not just me trying to be nice to him. I feel like he was born to interview Donald Trump. The thing about Chris that I think people give him a hard time for is that he interrupts as part of his speaking style and as part of his interview style. Literally: When I say as part of his speaking style, I mean he interrupts himself. He’s a guy who is completely willing to jump in not just at a time when other people might hold back, but jump in repeatedly as a way of turning the conversation into a constructive place when it has stalled or when he can predict where you’re going. That impatience on his part makes him seem like this kinetic guy who’s very different than everybody else on TV, but that apparently is the Kryptonite for interviewing Trump. I want Chris Matthews to get every Donald Trump interview that the media is going to get over the next five weeks because finally there’s somebody who’s the same vintage, [has] the same bluster. Pathological liars should all go to Chris Matthews for interviews. I fantasize about being able to interview Trump. Who knows if I ever will be? What do you make of Megyn Kelly being held up as this exemplar of good journalism? It’s a weird turn of events for anyone who regularly watches her race-baiting show. [Laughs.] It is an accident of our schedules that I have never seen Megyn Kelly’s shows because I have this thing that I’m busy doing every night at the same time her show is on, so I feel like I can’t substantively comment on it. Actually I don’t have a DVR. I do have a TV now, but I don’t have the recording capacity. Has there been tension at MSNBC over the different ways you and Chris Hayes, as opposed to, say, Joe Scarborough and Mika Brzezinski, have dealt with Trump? No. Even though we all work in the same building, we don’t really work together in any sense. You know what I mean? They do their show, we do our shows, and never the twain shall meet. I do feel like the editorial independence that we’ve got is helpful, if only because everybody has got a clear lane. It would never occur to me to criticize the way that some other show on this network was covering Trump because it’s not my job to, and like I said, I don’t even necessarily watch. I am just doing my own thing. [Laughs.] You’d think it [would] feel like we’re all in high school together, so we’d all be gossiping about each other and working together and going to homeroom at the same time, but really we all have our own lanes. I know that’s depressing. Sorry. Do you have a sense of what happened to Melissa Harris-Perry? No, I don’t. I don’t. You haven’t talked to her? No, I haven’t. I haven’t talked to executives here about it. I love Melissa, and I have followed it in the press, but she left and she hasn’t been in touch. She left under circumstances that are as clear to you as they are to me. I don’t have any inside knowledge, I should say. Turning back to Trump. Have the past nine months changed the way you think about cable news, and its role in covering campaigns? Here’s what I think about Trump and about how to cover him: I think that it is much more valuable to show and explain what he is doing than to host people responding to him or reacting to him. I feel like there’s a lot of useless media ink and airtime being wasted on people expressing themselves about Donald Trump, which is essentially just creating more of a cultural dynamic around him rather than helping people understand what he’s doing and see what’s important about it. I just feel like it needs to be a documentary approach rather than a commentary approach, because people expressing themselves about how they feel about politics is something that everybody can get at home. We’re professionals and we have access to lots of resources and archives and researchers, and that’s what we should be using. That’s interesting. I think a lot of people think of you as doing commentary. I see my job more as explaining things rather than emoting about things. I did a long piece the other day after his abortion comments at the Chris Matthews town hall. It was a little bit of media criticism, which is not something that I usually do, but I felt like I needed to show what was notable about what Trump said was not that it was outside the mainstream of Republican policy options on the question of abortion. It was actually quite mainstream; it was just uncareful in political terms. But if you take the pro-life position on its face, that is what Trump was expressing. He was just doing it in more blunt terms than politicians usually do. There’s nothing uniquely obnoxious about what Trump suggested. The shocking thing is that he said it. Well, pro-life people are hypocritical the way everyone is hypocritical. Right? I’m interpreting that as disagreement. I agree that everyone is hypocritical, but what do you mean? Many pro-life people who say abortion is murder don’t want women to be penalized for it. There’s something hypocritical and intellectually incoherent in my mind about that position, but people are hypocritical. Yeah. The thing that sort of put me over the edge is when Ted Cruz put out a sanctimonious statement criticizing Donald Trump for his draconian position on abortion, and it was like hold on, wait a minute. The fact that Ted Cruz is able to get away with this without people spitting coffee out of their noses all over the country and every newsroom in the country rushing to air with how ridiculous that was shows you that the Trump comments are not being adequately explained. They don’t just need to be shown. They need to be explained. To turn to the Democrats, are you surprised at how successful Bernie’s campaign has been? Do you think he thinks he can actually be president? I was one of the first people at the start of the Democratic campaign who was like Look, this Bernie Sanders thing doesn’t appear to be an asterisk. We were among the first places that covered the really large size of his rallies. I remember interviewing Sen. Sanders right after he introduced his campaign, and then once it was clear that it was going to be a bigger deal than maybe he thought it was. I remember asking him, “Are you surprised that you’re kind of taking off like this?” I think he answered my question honestly. He said, “I am legitimately shocked. I am surprised myself.” I think that he did not know it was going to take off the way it did. I think where he’s at right now is he’s just trying to win. Who are you voting for in the New York primary? I vote in Massachusetts, so I already did. I’ll never tell. A lady never tells. All I read all day long is news and analysis and stuff. I read the same stuff that everybody else reads. The stuff that I read for the health of my brain is usually—this is going to sound weird—but it’s usually terrorism stuff. I read a lot about terrorism and Middle East politics and national security stuff. Malcolm Nance has this new book out about defeating ISIS. It’s not like a prose book. It’s like an encyclopedia. The really nice thing about that is that reading an encyclopedia doesn’t keep you up at night. You read as many entries as you want and then it’s time to go to sleep and pick up with improvised explosive devices in the morning. So, yeah, my downtime reading is about bombs. Not to get too psychological, but why do you think that this is your downtime reading? It doesn’t necessarily calm me down, but I feel like it’s the thing that I really need to know. And I defeat my own fear about these things by trying to feel well-informed about them, but also there isn’t—especially in the middle of an election year—a day-to-day incentive during my work day to make sure that I’m keeping up on national security stuff. But it is kind of my main interest in the news, so I end up reading it outside of work hours. I know that sounds really boring, but that’s what I do. It’s not as valuable as watching Megyn Kelly, but what are you going to do? I’ll try to get myself one of them there recording devices that you discussed.